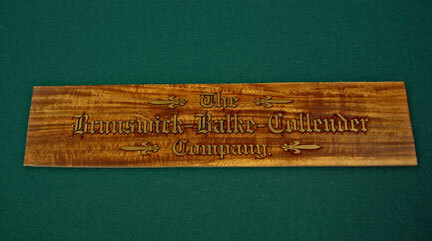 #11-04 Replacement lettering for Brunswick pool cue rack or Brunswick pool ball rack. Two types available: Lacquer decal for use by professional refinishers or self-stick pressure sensitive version for ease of application. Three sizes available: 12" wide for cue racks, 6.5" wide and 5'5" wide for ball racks and smaller items. $22 each.